If slightly alkaline, structured, living, great tasting water is what you are seeking, then you have come to the right place. Why spend thousands for some fancy water ionizer, when you can do the same and even better with Aquanutria. Let us share a little secret with you. Any clean source water can be turned into a slightly alkaline, structured drinking water and so much more for literally pennies. Aquanutria is a water treatment product that has been known to help maintain a healthy pH level in any clean source water used, or to make unsafe water, safe for drinking once more. Helps provide necessary minerals while aiding in the decreasing of unwanted pathogens and chemicals found in our drinking water sources today. Proper pH in the body is around 7.2-7.6, which is slightly alkaline, not high pH/high Alkaline. Aquanutria is a fossilized coral element, bonded with 99.999% pure silver ions in a tea bag (1-gram pouch) form that is used as a water purifier/decontaminant and mineral additive for your drinking water. Aquanutria may help to raise the pH levels of drinking water, while decreasing the unhealthy elements found in our water sources including most bottled waters today. Aquanutria will help to structure your drinking water while adding the perfect balance of ionic minerals necessary for creating a perfect, structured and living water. Better results achieved with distilled or reverse osmosis water. The lack of minerals in these types of water will help to release more of the ionized minerals into complete suspension for better absorption. This helps to dynamically reduce the water’s surface tension for better hydration, while effectively releasing 112+ ionic, nutritive and extremely necessary minerals into your drinking water. These type of ionized minerals are 100% absorbable without the necessary digestive fluids usually needed to break down most of the essential mineral products used today. This eliminates the need to find superior calcium/mineral supplementation, since most calcium/mineral supplements are not even bio-available in the first place. Aquanutria Coral Calcium comes in 5 sealed, ziploc foil packs, with six tea bags (1-gram pouches) in each, for a total of 30 tea bags/pouches per 30 day supply. 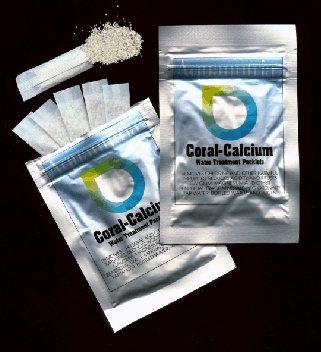 It is the highest quality of Coral Calcium available from Okinawa, Japan and produced with an exclusive proprietary process. Aquanutria Coral Calcium is far more affordable than most mineral supplements. This is a water treatment product, not a supplemental product and when used correctly can far outperform any calcium/mineral supplement, or water ionizers out there while saving you hundreds if not thousands on unnecessary technology. When it comes to water ionizers such as Kangen and others out there why would anyone spend hundreds to thousands of dollars for something that is it not very portable, it’s NOT easy to use, most people do not like the taste of the product water and most units have no form of a water decontamination or proper re-mineralization process built in. When it comes to the taste of the water from most ionizers on the market today, most surveyed say they don’t really care for the taste. Out of everyone surveyed tasting the Aquanutria Coral Calcium, 99% said they love the taste and especially the feel/smoothness of the water, and actually craved the water like they never have before, hence they hydrated better while getting proper mineral absorption. Aquanutria Coral Calcium also reduces surface tension in the water thereby making it a wetter water, or smaller water molecules providing easier access in and out of the cells and surrounding tissues for better hydration, absorption, detoxification, oxygenation and mineralization. There are many qualities of coral calcium from Okinawa and elsewhere around the world that range from poor to above average, to even just plain sand that do nothing. We only carry the highest quality available in the original, proprietary, tea bag form for proper assimilation and functionality – WE ONLY CARRY THE BEST! To request an assay contact us any time. Lower prices are available on larger volume purchases. To your health and balanced alkalinity!